Integrative Health Center of Maine currently does not have Therapy Dogs at our practice. What is a therapy dog? Therapy animals bring comfort and provide medical benefits to those who are suffering. Local hospitals such as Maine Medical Center have been employing therapy animals for years. Studies have shown multiple positive health outcomes for conditions such as stress, anxiety, depression, high blood pressure, and grieving as well as affecting our sympathetic “fight or flight” nervous system and other hormones associated with well-being. 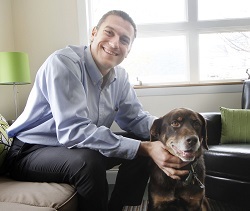 Many patients just enjoy having a dog to pet while they tell their stories to our practitioners. For much more information about the health benefits of therapy dogs and other therapy animals, please visit www.therapydoginfo.net. IF YOU HAVE ALLERGIES TO DOGS or prefer not to have a therapy dog present, please notify the staff ahead of time. We have efficient air filtration systems and our dogs tend to be more hypoallergenic, but given advanced notice we can take additional measures to ensure your comfort. Therapy dog service is complementary.